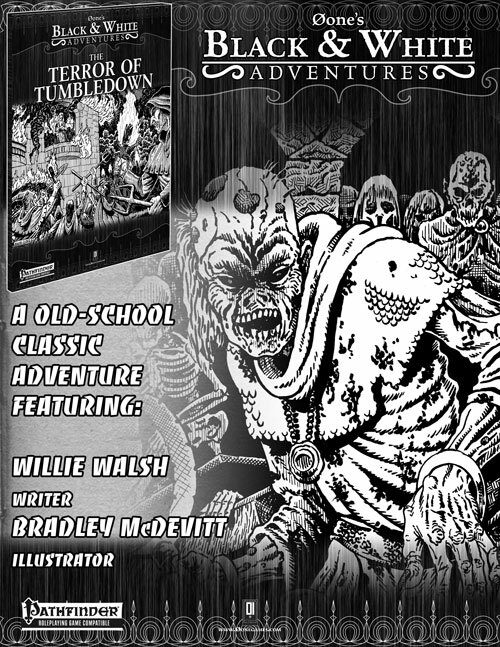 “The Terror of Tumbledown” is a Pathfinder Roleplaying Game compatible scenario for 5th-level player characters, written by Willie Walsh and illustrated by Bradley McDevitt and Gerry Swanson. 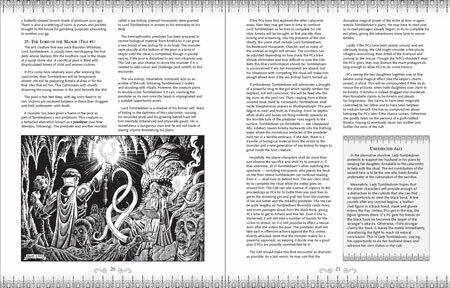 The adventure makes a stiff challenge especially in its final encounters, and it introduces three new dangerous monsters. It is set in a partially ruined and seemingly abandoned manor house in a bleak semi-wilderness location that has an evil reputation. His speech was answered by a hail of missiles from the screaming crowd: stones, cobbles, flasks of oil, and finally torches. First one tongue of flame sprang up from the rooftop, then another, until the fire took hold. With a final gesture of disgust, the master turned from the window and walked stiffly into the growing inferno. The crowd waited a while, cheering as the slates began to crack and slide to the ground. Then the roof beams ablaze, the walls failing, a terrible piercing cry seemed to rise up from the very foundations of the manor house into the bleak, starry sky. The most fear filled panicked at the other-worldly horror that this must surely represent and turned to run. A final stampede of friends and neighbours from the village slipped and slid back down the hillside, few brave enough to look back at the crumbling ruin. The terror was surely ended that night, but even today, ten years on, no-one from the village will pass near to the blackened remains of the manor even in daylight. And nobody would be foolhardy enough to brave the road nearby at night. This adventure was specifically designed to be used with the tiles contained in 0one's Black & White: Tumbledown Manor product, but it can be easily played without them. Furthermore it can be inserted in any ongoing campaign with ease.